Posted on February 10, 2011 March 4, 2015 by Sarah R.
In his article, “Surveillance in the Digital Enclosure,” scholar Mark Andrejevic takes on the task of questioning the often-idyllic and largely positive rhetoric frequently used to describe the variety types of ubiquitous, cloud and always-on computing. In so doing, he invokes the sci-fi visionary of the 1980s, William Gibson, who imagined many characteristics of the modern networked computing environment before it actually existed, and reminds us that that vision was hardly idyllic. Rather, it was a dystopian near future that Gibson portrayed, characterized by surveillance and control. 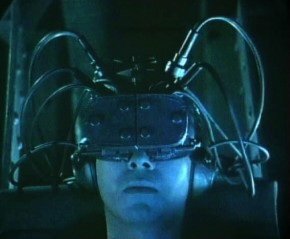 Early depictions of a jacked-in, always on networked future included images of virtual reality prosthetics and cyborg body modification, often against a backdrop of a dystopian and depressed world. 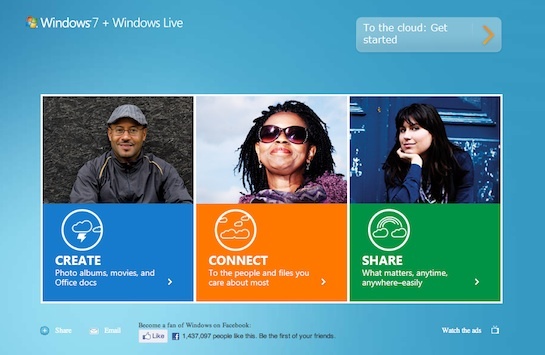 Which narrative is more realistic, in the context of the brave new world of cloud computing? Andrejevic suggests that, despite the rhetoric of convenience and untetheredness, the Faustian bargain into which users enter in order to gain the convenience of access to their information and the suite of applications cloud and ubiquitous computing provisioners offer comes at a great, yet unseen cost: the profound recentralization, consolidation and subsequent commodification and control over both the content users upload to the cloud and their habits and behaviors that can be turned into valuable data, mined, extracted and sold. Andrejevic rejects the very metaphor, the “cloud,” upon which these services stake their appeal, preferring a more pessimistic turn of phrase, that of “digital enclosure,” purposely invoking the great land enclosure movements of the 17th century, when the commons gave over to private land ownership (a favorite view of Duke’s Jamie Boyle). Not just a simple semantic quibble, the difference between the two visions is actually profound; one suggests limitless potential space and the other, the very inverse, characterized by boundaries and control. The ease with which this control Andrejevic asserts is being perpetuated seems perplexing, at first. How could so many smart and tech-savvy people be so easily either misled or rendered docile in the face of the enclosures to which they voluntarily submit? The first answer is “through the power of seduction”: being located in the cloud provides immediacy, tangibility and convenience; devices interact and data are shared over them all in real time and irrespective of the constraints of physical location. The interoperability of the suite of ubiquitous computing functions, from basic wireless connectivity to specific apps and tools provided to users free of upfront charge, is alluring. Further, Andrejevic points out that the cloud-based platforms and products frequently heavily tout their primary user-directed functionalities, but mask the advertising, data gathering and information commodification that is often at the core of the revenue-generation side of their business. But even when the overt functionalities do not fully mask the behind-the-scenes data-gathering or surveillance processes, the ease-of-use and benefits of succumbing to the cloud or to the ubiquitous computing environment are highly seductive and distracting, such that most users will never question where and how the limits surrounding them are imposed. The limits are often designed to be imperceptible to users, purposely. The second is through the sheer and overwhelming amount of rhetoric that blindly champions the new control and commodification paradigm. Many smart people have made many bold claims about the liberating nature of computing, often focusing, as was the intent, on the sort of in-the-weeds functions relating to mobility, access and ease of use. The rhetoric of this sort is popular, uncritical and ultimately confusing to those who seek to question the behaviors or philosophy of the data-gatherers. Andrejevic foresees nothing short of the tracking of everything for purposes of commodification of the data generated, a regime of contracts superseding that of law, and the transformation of the notion of “freedom” taking on a new and nuanced hue; the act of doing anything freely begins to transpire within the confines of the new digital enclosures, and freedom of choice is a choice among a narrowly defined set of acts pre-selected by those in control. In this way, the digital enclosure is a fundamental process of the accumulation and consolidation of power and control – and with it, capital, given the new value that the gathered data takes on in a society driven by data analysis and the commodification of information for use or resale. How better to gather this data than to construct the very arenas in which it is generated, make them appealing for their overt benefits, employ a regime of complicated contracts that determine the rules of engagement while obfuscating the true value of what is being surrendered by users (i.e. their free labor), and then sit back to collect and monetize the valuable information generated and volunteered? As Andrejevic points out, once all critical services engage in the practices he critiques, “the ‘freedom’ to avoid monitoring becomes, in practice, a theoretical one” (314). The logical extent of this new surveillance culture is implicated, too, when considering the new hunger for which the government seeks information under the auspices of its “national security” mandate. Concern for the collection and handling of commodified information, gathered in the digital enclosure, is heightened in light of the recent report by the Washington Post, which revealed that over 2000 private companies contract with the government for the purposes of national security-related data analysis and security work. Are we to assume that these private companies, acting on behalf of the government, are not attracted to the massive data volunteered in the cloud? Could they be building digital enclosures of their own (through the Facebook platform, for example) and inviting users to volunteer information directly to them for analysis and digestion by the for-profit national security apparatus? This one-time Orwellian vision seems thoroughly plausible in our current environment. So what solutions are at our avail? Dismally few, notes Andrejevic, although the picture is not hopeless. The first step in reversing this tide is to raise awareness about the ways in which commonplace digital tools actually function. There must also be new alternatives formulated, particularly as the “preprivatization” communication systems once commonplace in universities and government environments are increasingly and rapidly disappearing (reference the University of Illinois’ process underway to turn over its undergraduate email infrastructure to Gmail). Another avenue through which pressure must be exerted is in the policy arena, where telecom and other digital giants are quite adept at creating legislation favorable to reification of their control and consolidation. A cynic might suggest that there is little hope in pursuing this avenue, at least without the component of direct and highly visible resistance on the ground. The bottom line is that the contemporary dominant iteration of the Internet as commercial space is only one vision. That it has been so successful points to the vast financial and technological resources backing the digital enclosure efforts, on the one hand, and to the selling of tools based on their convenience, accessibility, ease of use and functionality while downplaying their data-gathering and surveillance activities. Ask a person on the street, for example, what Google’s primary business is, and the answer will undoubtedly be, “search engine,” and not the more accurate, “advertising,” or perhaps “data-mining.” We must, therefore, begin to combat this problem of obfuscation by unveiling and understanding the business practices, functionality and technological underpinnings of the ubiquitous computing platforms and tools. We must identify alternate models, past and present, and offer them to users interested in maintaining greater autonomy and transparency in their networked computing environments (the Diaspora project,http://www.joindiaspora.com/index.html, might be one such alternative deserving of attention). We must continue to uncover the true costs and value of information gathered and collected from users, showing how it is commodified and used. Likely most challenging of all, we must resist egregious abuses of our own digital autonomy and refuse to engage and enrich systems that abuse us with our own personal and creative material. 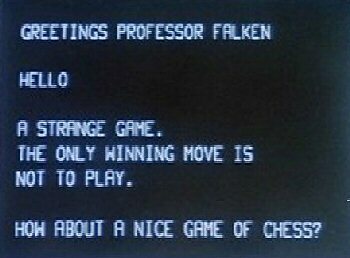 With apologies to “War Games,” it may just be that the only way to win is not to play. Andrejevic, Mark. Surveillance in the Digital Enclosure. The Communication Review 10, no. 4: 295, 2007. A version of this article appears at http://www.hastac.org/blogs/sarahr/questioning-cloud-andrejevics-surveillance-digital-enclosure.